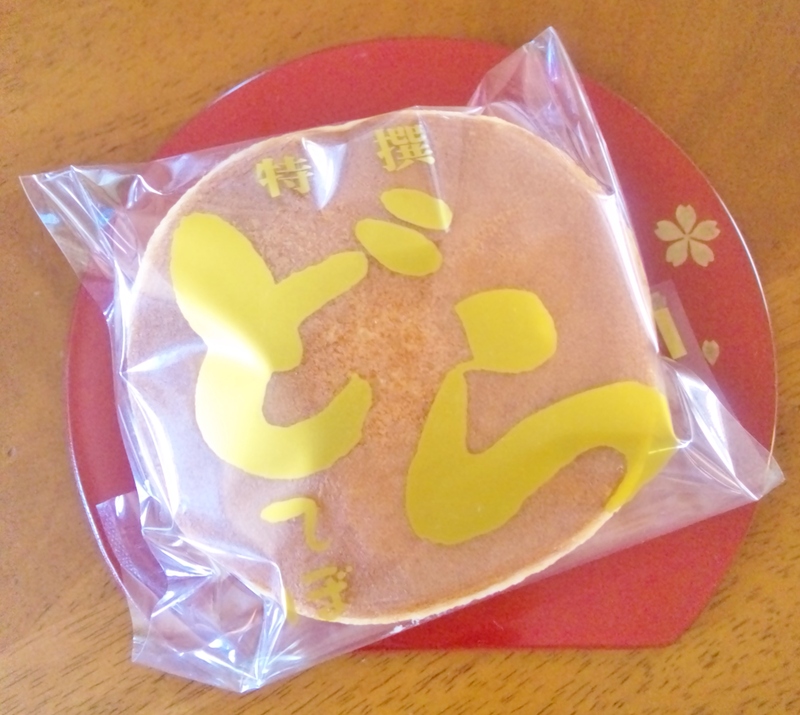 This is dora-yaki, a pair of pancakes with anko, red bean jam, normally sandwiched. Shichino is a popular dora-yaki shop who serves a variety of filling flavors. As the special choice of month, this April features Earl Grey tea mousse and whipped cream. You can enjoy fresh dora-yaki and soft drink on the table set within the shop – oh, Earl Grey will be finished today! From the end of April to the beginning of May, we have a semi-vacation called “Golden Week”. Today is Showa Day, one of public holidays set during GW. Others include Constitution Memorial Day on May 3rd, Greenery Day on 4th and Children’s Day on 5th. If any of above days were on Sunday, the next Monday will be a holiday. And if your company is flexible enough, you would be able to have paid holidays from April 30th to May 2nd. It really depends, so many of us expect good timing which brings longer vacation. Kuro- (=meaning “black” in Japanese) chan is one of Tora-chan’s boyfriends – maybe. He puts on a black jacket on a white shirt, which reminds us of “Piano”. This spring with many cold days, including a snow in April, had Kuro-chan to share the warm bed and meal with Tora-chan almost every night. Boy, where’s your family? If you’d like to stay here, you must let us bring you to see Dr. O.
Mikan-chan often calls mom to stay by her for meal. When asked “tastes good?”, she replies “yeah”, twisting the top of her tail. Relaxing on mom’s legs, she continues her purring by her tail. 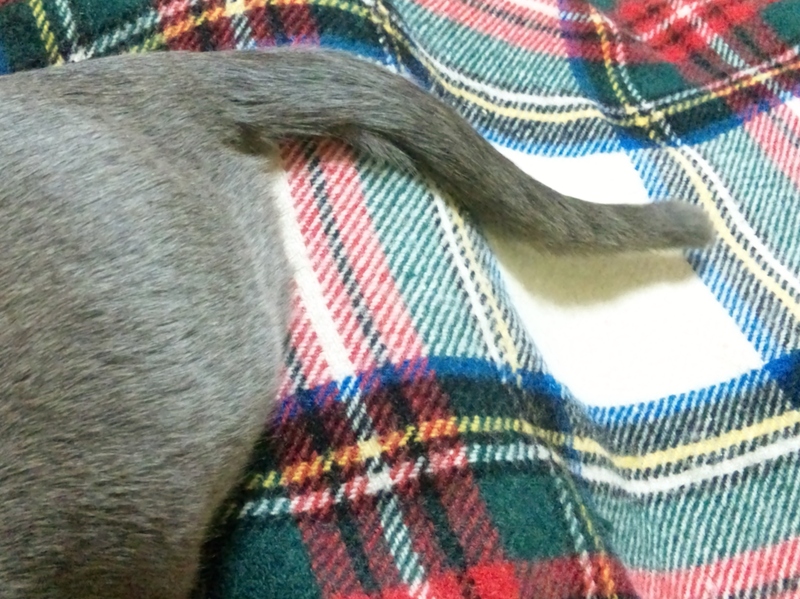 Having her tail straight-up, she says that she had got up from a nap. 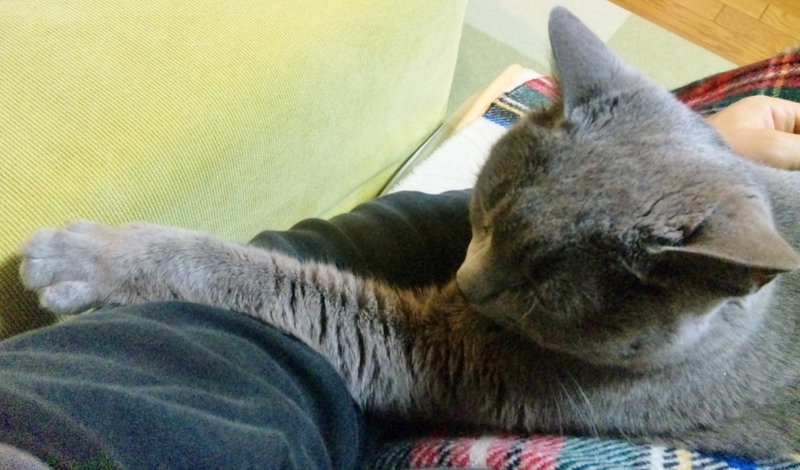 Her satisfaction is shown in the tail holding around mom’s arm. Professor S, Master Mei-Shu and mom-in-law of Mei-Shun are of an age by chance. They are always kind enough, giving visits, messages and gifts during her hospitalization. It is a genuine honor to have such great “friends”. The most popular breed Somei-Yoshino is over. Now wilder Yama-Sakura and gorgeous Yae-Sakura are in their last bloom. Mei-Shun prefers the former, which looks chic but is ranging from almost white to clear pink color. Some of them are so shy that we do not know they are there, behind other trees. However, their presence would be recognized by petals flying from nowhere.